Douglass heads communication efforts for the White House health care reform push. WASHINGTON (CNN) - New president, old headline: the White House fired back at the Drudge Report Tuesday, part of a fresh "viral" pushback over what it called a "campaign of misstatements and outright falsehoods" on health care. In a three-minute video posted on YouTube and on the White House blog, Obama aides pointed to a 2007 video on blogger Andrew Breitbart's site that Matt Drudge linked to under a headline that told readers it showed President Obama explaining "How His Health Care Plan Will 'Eliminate' Private Insurance." "I don't think we're going to be able to eliminate employer coverage immediately. There's going to be potentially some transition process. I can envision a decade out, or 15 years out, or 20 years out," Obama says in the bite. 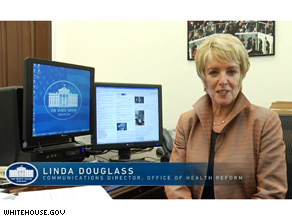 In the White House video posted overnight, Linda Douglass - the former ABC News reporter who now heads communications efforts for the White House's health care push - tells viewers that "one of [her] jobs is to keep track of all the disinformation that's out there about health insurance reform. "And there are a lot of very deceiving headlines out there right now, such as this one - take a look at this one," she says, pointing to the Drudge headline. "Well, nothing can be farther from the truth. You know the people who always try to scare people whenever you try to bring them health insurance reform are at it again, and they're taking sentences and phrases out of context and they're cobbling them together to leave a very false impression." Because Obama has spoken so much about health care reform, she says, "there are people out there with a computer and a lot of free time, and they take a phrase here and there, they simply cherry pick and put it together and make it sound like he's saying something that he didn't really say." The video is part of a larger White House effort. "We intend to use a lot of the grassroots viral Internet techniques from the campaign to beat back the campaign of misstatements and outright falsehoods about the President's efforts to reform health insurance," said White House deputy communications director Dan Pfeiffer. The clip was no longer on the Drudge Report Tuesday morning. The only references to Obama were headlines related to and posted under the image of a poster that depicted the president as the Joker from Batman over the word "socialism." UPDATE: The Drudge Report responded Tuesday by prominently linking to the White House blog post from his Web site, along with video which it said showed Obama advocating a single payer health care plan.